1:1 tuition is available with additional fee to those shown above. Group bookings are available, subject to numbers there is a sliding scale of discount where possible. RYA Course / Own Boat Tuition and Delivery Price Guideline for 2018 (Poole Area). The price guideline below includes VAT and is for one person per day using own boat for tuition unless otherwise stated. For each additional person in the family or group booking, an additional charge per person per day applies. 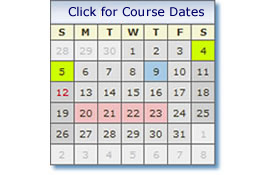 The RYA courses are 1/2/4 or 5 days duration as indicated; course dates are available by clicking on the calendar to the right. Travel, food and accommodation where required are in additional to any daily rate. Our experienced Charter Skipper/Instructors are also available for you. Their daily rate will depend upon the vessel length, the charter or delivery duration, type of passage and vessel and locality, UK or overseas. From £250 per day for 14mtr - 20mtr vessel. Group bookings taken, courses can be run anywhere subject to terms and conditions, call for details.